Tonight the Grammy’s was everything I LOVE. Music, dancing, laughter, makeup, and fashion. But as I was watching I felt this year was different. The tone was different. SO MANY MISTAKES WERE MADE. SO MANY FEELS. So many lessons in the little moments. Here are a few, maybe you caught them too. I missed the beginning of the awards show but when I turned on my TV I see two guys start to unzip their pants and take them off! 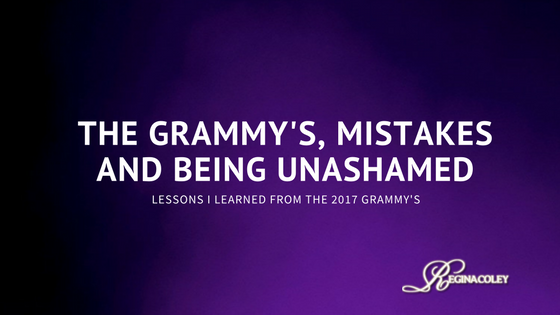 (Thanks while I’m sitting there with my kids…) As I was trying to figure out what was going on Twenty One Pilots begins to describe that years ago when they were watching the Grammy’s with their friends they realized they were sitting there in their underwear. They said to themselves that if they ever won a Grammy they would accept it in their underwear. Lesson: Anyone from anywhere can do anything. We are all becoming. Don’t forget all that you’ve gone through to get to your next level. During Adele’s tribute to George Michael she realized she was off key. I mean this is ADELE. She cussed and cut the music and asked to start over. Lesson: Do it right even it that means you have to start over. People will respect the respect you have for doing your job to the best of your ability. Then during Lady Gaga’s performance one of the microphone’s wasn’t working. But it seemed to slow time because we could see Metallica’s mouth moving but couldn’t hear (at least it did for me). Lesson: Keep dancing! If that means you have to switch it up, do it! But it you are the one who made the noticeable mistake, fix it and fix it fast because someone is counting on you. Bruno’s tribute to Prince was cool and surely had me dancing in my living room. I thought he was phenomenal but one thing I kept hearing online was “There was only one Prince.” And that’s the God’s honest truth. Lesson: Do your job like no one else can. Set the bar high for others to follow. Chance the Rapper stole the show for me though. We have to learn NOT to hide our foundation and faith. Here is this man who has been given a platform and he chose to use it to praise God. He knows God is the reason for his success. I saw people online saying they didn’t know who he was but now because of this one moment, they are now a fan. Sometimes your moment comes from just simply being ready, being authentic, and unashamed. Lesson: Be unashamed for who and whose you are. And the funniest in my opinion…you all know I mentor girls and little Miss Blue Ivy decided that while her mommy accepted her Grammy she and her friend were going to check out the contents of her Hello Kitty purse! (So sweet) Lesson: Have fun! 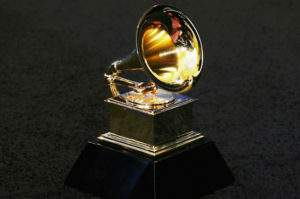 Question: What was your favorite part of the Grammy’s?